Water treated with PristineBlue® feelssofter and looks inviting without a chemical taste or odor. We are constantly developing thoughtful, sensible solutions that focus both on the environment. Since 1956, GLBâ„¢ has been on the cutting edge of product development for swimming pool water care. Created a process and tools that effectively treat and dispose of residential wastewater. Programs focus on exploring ways to make the most of lifeâ€™s essential resources. 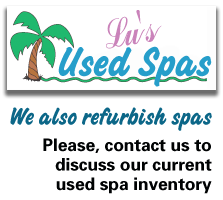 We can help you find the perfect solution for maintaining your spa. Relax knowing that you don’t have to constantly test your water and adjust the chemical levels… we can help you refine the process to only have to test and adjust once every two weeks. Lu's Pool is proud to carry lines of product from these companies. If you do not see a product that you have used previously, please ask about it. We can order products in for you. Be sure you know the volume of your spa in gallons. Your spa dealer can help you calculate the volume and assist you with all aspects of spa ownership. They can analyze your water and recommend products and their phone number should be the first one you dial when you have a question. Cause- Dirt, dead algae or dead bacteriaRemedy- Shock with 10 milliliters (or 2 teaspoons) of PristineExtra® per 100 gallons of water, filter 2 hours then clean the filter. Remedy- Shock with 5 milliliters (or 1 teaspoon) of PristinePower® per 100 gallons of water. Remedy- Test pH and alkalinity and adjust as needed.